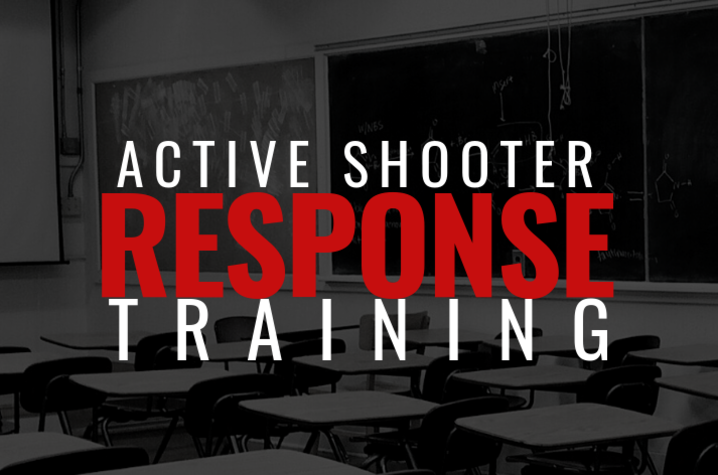 LEXINGTON, Ky. (Feb. 12, 2019) — There are a variety of descriptions for the upcoming Active Shooter Response Training including active aggressor response training, active shooter prevention training, or active shooter reaction training. Regardless of the description, the heightened need for training in advance of an active shooter incident remains the same. University of Kentucky Police Department has offered active shooter response training since 2007 succeeding eye-opening lessons from the Virginia Tech shooting the same year. The demand for preparation in advance of an attack has remained high for well over a decade. Since its inception, there have been three trained and certified instructors for the course who have taught classrooms with dozens of participants to hundreds. Instructors have traveled across the Commonwealth to train individuals who work in a variety of businesses including day care centers, restaurants and high schools. Through this program, UKPD has trained over tens of thousands of individuals for preparation of an active shooter event. During the active shooter response presentation, community service officers will teach participants how to develop a survival mindset. The concept of "run, hide, fight" is examined and expanded upon with the caveat that there is no one-size-fits-all solution for every incident. Participants will gain a stronger understanding of the role of law enforcement during an active shooter event. Life-saving tips will be shared including barricading doors with heavy furniture, utilizing a belt to lock a door and finding sharp objects to fight back if necessary. Training is a mixture of classroom-based teachings and audio-visual aids created by the United States Department of Homeland Security. The presentations are free and open to the public on a first-come, first-served basis and are held at the Gatton Student Center in Room 331. The student center is located at 160 Avenue of Champions in Lexington. For more information visit www.uky.edu/police or contact Officer Amy Boatman at amy.boatman@uky.edu.